TaiChi-Qigong Research - Rising UP! There is an increasing body of research that reveals the benefits of Tai Chi and Qigong for a variety of diseases and conditions, including multiple sclerosis, stroke, Parkinson's, arthritis, COPD, heart disease, diabetes and much more. As a result, doctors are telling their patients to seek out Tai Chi and Qigong classes. There is a need for much more accessible information about the benefits. Below you will find links to a variety of studies and websites that provide information and research. Exercise science professor Peter Harmer's publication in The New England Journal of Medicine has been selected as a Top 10 story of 2012 by Journal Watch Neurology. Harmer's study, "Tai Chi and postural stability in patients with Parkinson's disease," was also recognized by the American Academy of Neurology as the most important advance in movement disorders research for 2012. N Engl J Med 2012; 366:511-519February 9, 2012DOI: 10.1056/NEJMoa1107911Fuzhong Li, Ph.D., Peter Harmer, Ph.D., M.P.H., Kathleen Fitzgerald, M.D., Elizabeth Eckstrom, M.D., M.P.H., Ronald Stock, M.D., Johnny Galver, P.T., Gianni Maddalozzo, Ph.D., and Sara S. Batya, M.D. We found that a program of twice-weekly tai chi for 24 weeks, as compared with a resistance-training program or a stretching program, was effective in improving postural stability and other functional outcomes in patients with mild-to-moderate Parkinson's disease. Tai chi training also significantly reduced the incidence of falls, as compared with the stretching program. Improvements in primary and secondary outcomes were maintained 3 months after the intervention, a finding that is consistent with prior research involving adults 70 years of age or older.13 No serious adverse events were observed during tai chi training, indicating the safety and usefulness of this intervention for persons with Parkinson's disease. The improvement in maximum excursion with reduced deviation in movement, as shown on the posturographic limits-of-stability tests, suggests that tai chi training reduced dyskinesia by increasing the ability of the participants to adopt effective sway strategies (at the ankle or hip), engage in controlled movements with improved balance control near the limit of stability, or both. Clinically, these changes indicate increased potential for effectively performing daily life functions, such as reaching forward to take objects from a cabinet, transitioning from a seated to a standing position (and from standing to seated), and walking, while reducing the probability of falls. Similarly, the marked increase in gait velocity in participants in the tai chi group was associated with significant increases in stride length. These improvements in gait characteristics support the efficacy of tai chi in alleviating the bradykinetic movements associated with Parkinson's disease. The tai chi protocol stresses weight shifting and ankle sway to effectively move the person's center of gravity toward the limits of stability, alternating between a narrow stance and a wide stance to continually change the base of support, increasing support-leg standing time and trailing-leg swing time, engaging rotational trunk movements with upright posture, and performing heel-to-toe (forward) and toe-to-heel (backward) stepping movements to strengthen dorsiflexion and plantar flexion. These inherent training features may have led to improved postural control and walking ability. Although these improvements indicate that tai chi would be effective in enhancing neuromuscular rehabilitation, the mechanisms behind the therapeutic change in participants' motor control and mobility remain less understood and warrant future exploration. Falls are a common and sometimes life-threatening event in patients with Parkinson's disease.32,33However, to our knowledge, no clinical trial has shown the efficacy of exercise in reducing falls in this population. Thus, this study adds to the behavior-based treatment literature by showing that tai chi can effectively reduce the incidence of falls in patients with Parkinson's disease . . .
"In the past two decades, interest in the health benefits and therapeutic merits of Tai Ji Quan has grown among the biomedical research and clinical rehabilitation communities. 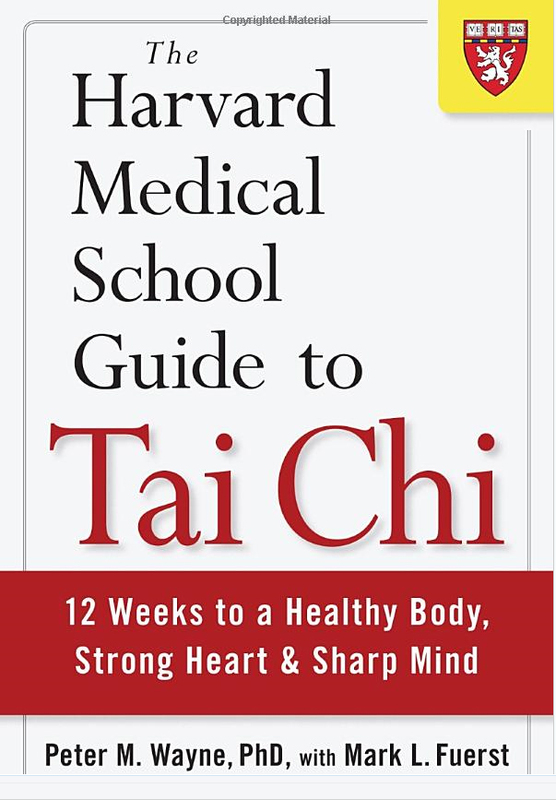 It is now apparent that its unique features of mind‐body integration (i.e., mind‐directed movements), movement kinematics, and inherent postural control mechanisms have made Tai Ji Quan both applicable and amenable to the prevention and/or treatment of various chronic medical conditions [14‐15], including heart failure , fibromyalgia [17‐18], and balance impairment [19‐20]. Therefore, translation of the original intent of Tai Ji Quan practice to contemporary therapeutic applications aimed at preventing or reducing movement‐related disorders clearly represents a clinical innovation with potential applications in modern behavioural medicine." Roger Jahnke's article describes studies showing that mind-body practice that induces the relaxation response (including Tai Chi and Qigong) can change genetic expression, enhance immune response and much more. The article has an excellent bibliography with online links. Tai Chi exercise reduced falls among stroke survivors. The ancient Chinese martial art helped survivors achieve and maintain balance to aid stroke recovery. HONOLULU, Feb. 6, 2013 — Tai Chi may reduce falls among adult stroke survivors, according to research presented at the American Stroke Association’s International Stroke Conference 2013. PubMed Article: Tai Chi is good for stroke! If you have mild to moderate heart failure, the ancient Chinese exercise tai chi may help improve your mood, your ability to exercise independently and your quality of life, according to a study in the Archives of Internal Medicine(Volume 171, page 750). Investigators randomly assigned 100 people, average age 67 years, with mild to moderate heart failure to attend tai chi classes for 12 weeks or traditional classes on diet, exercise, medication use and other self-management strategies. Participants in the tai chi group learned a simplified Yang style of tai chi. Both groups received educational materials and the tai chi group also received an instructional video and was encouraged to practice at home at least three times a week. On average, tai chi participants attended 75 percent of their classes, while those in the standard group attended about 66 percent of their sessions. Those in the tai chi group reported practicing at home for an average of 10 hours each week. Take-away thought. After 12 weeks, the tai chi group showed significant improvements in indexes used to measure quality of life and mood disturbances and in their ability to exercise independently. Tai chi is a safe complement to standard therapy for heart failure. If you want to give tai chi a try, get clearance from your doctor first. A Taiwanese study just found that Tai Chi practiced reinvigorates stem cells, says the study just published in the international medical journal Cell Transplantation, increasing the number of stem cells by 3 to 5 times. Tai Chi practitioners enjoyed improved heart function, reinvigorated neural cells in the brain, balanced excitement and inhibition controls, and helped with mental trauma and nerve exhaustion (a big problem with many people in the modern world). Hypertension (high blood pressure) is one of the most common serious health problems in the United States. The American Heart Association estimates that about 73 million Americans have high blood pressure. In 2004 (the last year for which data is available), hypertension was responsible for 54,707 deaths. Qi Gong may be an effective method for treating hypertension as an alternative to prescription drugs and other allopathic medicine. World Tai Chi-Qigong Day Website: Great Resource for Research on wide variety of health benefits. TAI CHI FOR KIDS: Cari Shurman teaches Tai Chi for Kids around the country. Her website is: www.taichiforkids.com Her website contains a variety of types of information, including many of the items of research listed below. Tai Chi and mindfulness-based stress reduction may be transformational tools that can be used in educational programs appropriate for middle school-aged children. The Johnson Center for Pregnancy and Newborn Services of the Lucile Packard Children’s Hospital uses Tai Chi to helpi children who have cerebral palsy and other movement disorders. “Tai Chi represents optimal body movement, honed over centuries,” said laboratory director Jessica Rose, PhD. With slow movements as fluid as silk, the gentle Chinese practice of Tai Chi seems tailor-made for easing sore joints and muscles. The Arthritis Foundation recommends Tai Chi. Some summer camps for children with arthritis teach Tai Chi. A regular tai chi exercise program can help people (children and adults) better control their diabetes and lower glucose levels, according to a University of Florida study. Doing Tai Chi for 30 minutes once a week help lower the children’s blood pressure by about 10% average. The greatest reward from teaching tai chi is the number of students who went on to study medicine because of their study of tai chi. Repetitive Strain Injury is very common. Tai Chi movements exercises the entire hand, every joint and every combination of joints to alleviate RSI. During and after five weeks of tai chi lessons, adolescents with Attention Deficit Hyperactivity Disorder (ADHD) showed less anxiety, daydreaming, inappropriate emotions and hyperactivity, according to a study by the Touch Research Institute (TRI). Tai Chi can improve the pulmonary function of asthmatic children. However, they caution that long-term follow-up is required to determine the impact of Tai Chi on the severity of asthmatic symptoms. Journal of microbiology, immunology, and infection, February 2008. Studies on College students showed physical measures of pain and general health, and mental measures of vitality and mental health were significantly improved after Tai Chi. Scores on the mental health dimension appeared to be particularly sensitive to change. Tai Chi is one of the simplest ways for people who use wheelchairs to improve their physical and mental health. Taiji has positive effects on postural control. This collection on the latest and practical research data about the characteristics and beneficial effects of Tai Chi Chuan on various physiological and pathological matters is published as the 52nd volume of Medicine and Sport Science Journal. HEALTH BENEFITS OF TAI CHI : helps the heart, improves aerobic activity, relieves arthritis, builds confidence. CONTROL PARKINSON’S, DEMENTIA, OSTEOARTHRITIS AND OSTEOPOROSIS. Cari Shurman, MAT, founder of WITHIN Wellness Center in Miami, is the creator of Tai Chi Moves for Kids©. She holds a Master of Arts in Teaching degree and is certified as a teacher of Tai Chi and Qigong by the National Qigong Association, is a mentor of the Universal Society of the Integral Way and is a certified teacher of Five Element Qigong by the World Institute of Self Healing. In her 30 years of teaching and traveling around the world, Shurman observed Tai Chi being used in China as a needed break for students between classes. She says she has found nothing more effective for students than Tai Chi to help them do better and feel better about themselves. She has worked successfully with individual children, as well as groups, teaching them Tai Chi skills and focused energy to help them cope with learning and attention disabilities and hyperactivity as well as improving their day to day concentration and performance. Autistic children have responded extremely well to tai chi movements.